Lemon Pound Cake (Ultimate Lemon Cake Recipe) – This is the Best Lemon Pound Cake on the Internet! Tart, sweet and filled with lemon flavor, you will adore this Cream Cheese Lemon Pound Cake Recipe with a secret ingredient for years to come! Nothing beats the rich, buttery flavor of a homemade pound cake. My mouth waters at the thought of each bite melting in my mouth. I take pride in my own recipes; there’s nothing that I love more than serving my cake to someone new and watching their face light up after the first bite. After years of hard work, dedication and countless minor oven burns I’ve earned the title of pound cake master. I was taught by none other than my Big Mama: a woman who could whip up the perfect pound cake in minutes from what seemed like thin air. She dedicated a rather large portion of her life to teaching me her tricks and sharing the traditions her mother passed on to her. We made pound cakes on holidays, Sunday dinners and rainy summer days. Each one was delicious but they were made sweeter by the fact that they were shared with the people we loved. Today, the tradition lives on but in new ways. Don’t get me wrong, you can absolutely never go wrong with a classic pound cake. It’s moist, buttery and never overly sweet. Accompanied by vanilla ice cream, fresh whipped cream and berries, a pound cake can be enjoyed by everyone. But that doesn’t mean that adding new flavors and remixing the classic can’t be just as tasty. So when I started Grandbaby Cakes I decided to take the lessons my grandmother taught me and apply them to new recipes. A pound cake’s versatility is incredible; you can add almost anything and it’s guaranteed to be great. Now, don’t go all crazy. I’m not promising that your favorite bottle of wine or those dried mangoes in your pantry will work. On the other hand, there are other options like grapefruit, blueberries or coconut that will liven up your cake and surprise the people you serve it to. Never be afraid to be daring in the kitchen. Take a risk and watch it pay off. My Big Mama enjoyed the classic flavors of old recipes but she always encouraged my imagination. As I got older, she welcomed my newest creations and shared my excitement when what seemed like a crazy idea worked out wonderfully. As I share this recipe I’m sharing the product of not only years of trial and error and plenty of family tradition but also the product of my Big Mama’s undying faith in me. I have an affinity for all things lemony. This Lemon Pound Cake is just one of them (try these lemon pancakes or this blueberry lemon pound cake) My family has made all sorts of lemon cake recipes and even lemon pound cake recipes over the years. Big Mama makes fantastic lemon cakes. My two aunts make great lemon cakes as well. Even my mother has a fave citrus lemon and lime cake (her 7 up cake and my big mama’s sour cream pound cake recipe, which you can add lemon flavor to is a must try if you have it!). I have tried them all, and trust me when I say that it’s hard to figure out which one I love the best. It must be because at the end of the day, lemon rules in my book. If you put it in a cake, I will eat it. And not just eat it, devour it. 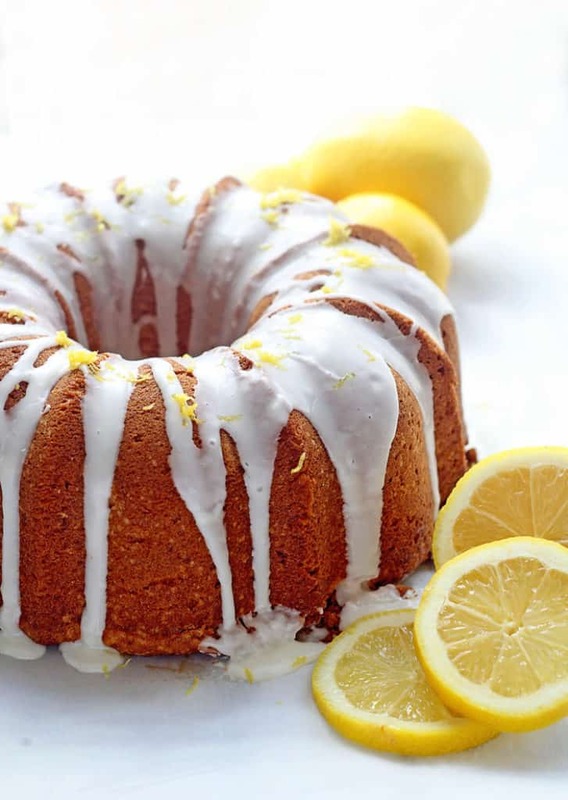 What Makes this Lemon Pound Cake Recipe the Best? This lemon pound cake recipe is probably one of the best I have developed. I think starting with a classic cream cheese pound cake recipe that I have been making for years put this recipe on the good foot. I have made this recipe so many times that I could possibly make it with my eyes closed. It is a tradition in my family to bring this cake whenever we have a get together. I thought the base of it would lend itself to a citrusy makeover. 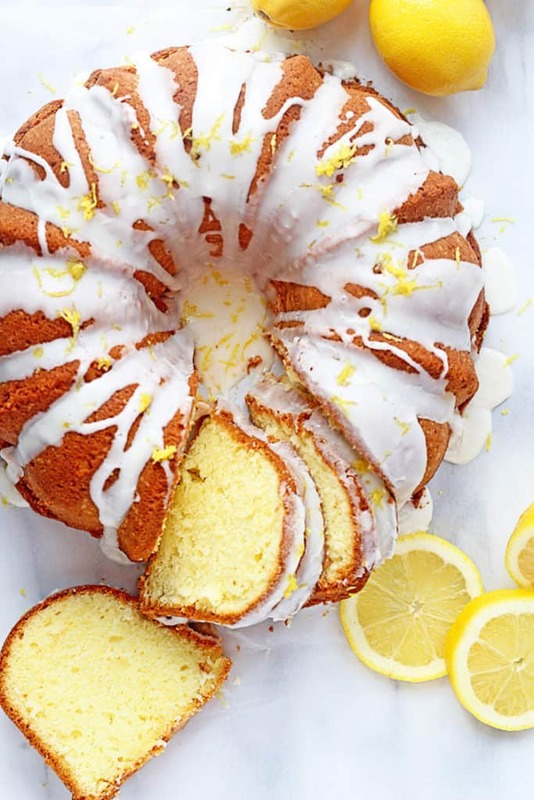 What is the secret ingredient in this Lemon Cake Recipe? So what were the changes I made you may be wondering? First I added in a secret yet fun ingredient which you won’t find in many lemon cakes: Instant Lemon Pudding. That’s right, lemon pudding. This ingredient adds two elements to this lemon cake recipe. One, it adds additional lemon flavor in a fun and exciting way. 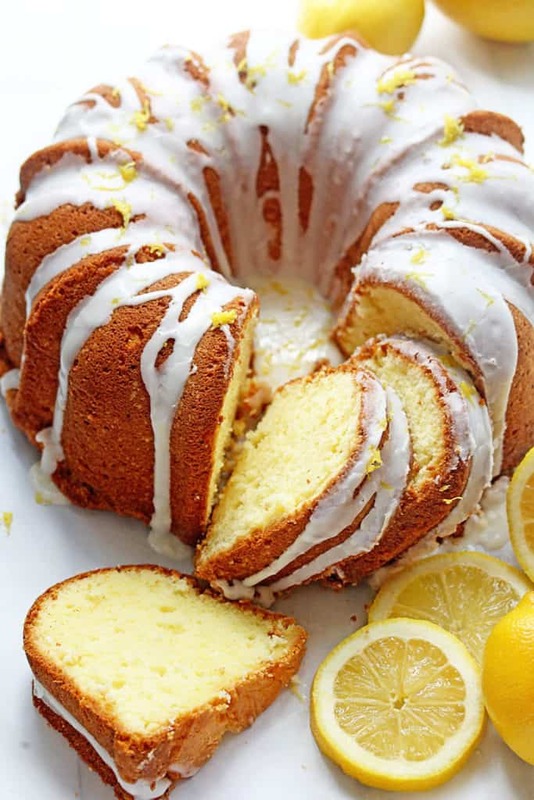 Each bite of this lemon pound cake recipe is bursting with lemon so you definitely won’t miss it. 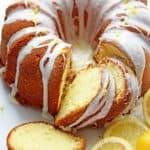 Trust when I say it makes this cake no ordinary lemon bundt cake. And two, it adds additional moistness to the finished cake. Think about how moist a pudding is. Now imagine that going into your cake. Each bite will melt in your mouth. Finally, I added in some additional lemon zest. This is not a play around lemon cake recipe. It adds as much lemon as you can take, just enough to make you pucker then dance uncontrollably. And P.S. If you need a lighter lemon cake recipe, try mine HERE. or if you love an amazing citrus cake, try this Mandarin Orange Cake. Lemon Pound Cake (Ultimate Lemon Cake Recipe) - This is the Best Lemon Pound Cake on the Internet! Tart, sweet and filled with lemon flavor, you will adore this Cream Cheese Lemon Pound Cake Recipe with a secret ingredient for years to come! Add room temperature cream cheese, butter and salt to large mixing bowl and begin creaming on high speed until smooth. Slowly add sugar and instant pudding to bowl and cream until light and fluffy which takes about 5-7 minutes. Lower speed of mixer to medium and add one egg at a time and mix until incorporated. Slow mixer to slowest speed and add flour one cup at a time into bowl until just incorporated. Do not overbeat at this point. Add lemon zest to bowl and mix. Once everything is incorporated, pour cake batter into greased and floured or baking sprayed 12 inch bundt or tube pan. Bake for 1 hour and 20-25 minutes or until a toothpick inserted into the center of the cake comes out clean. Allow to cool in the pan for 10 minutes then remove cake and place on cooling rack for an hour or until it is completely cooled. Whisk together powdered sugar and lemon juice until smooth. If it is too runny, add a bit more sugar or if it is too thick, add a little bit more lemon juice. You want to consistency to coat the back of a spoon but slide off easily. Drizzle on top of cooled cake, sprinkle with lemon zest and serve. Can’t wait to try this out! Have you added poppyseeds before? Hooray I actually haven’t but let me know if you try and how much you add and if it works out. Love your recipes . I want to know if I could substitute sourcream for the cream cheese in this recipe? I was wondering if I could use this same recipe to make mini lemon bundt cakes as well? Thank you! Yes you can. You will just need to change the bake time. What brand pudding did you use because the only lemon pudding I see is 2.9 ozs not 3.4. Or do you just weigh it out? Hi Jocelyn, my name is Marion Monson and I’m a recent graduate from Lecole Culinare. I was wondering if I could use sour cream and sprite instead of cream cheese even though I would love to use cream cheese too. I would not make that replacement with this recipe. It will be a totally different recipe all together lol. Try this one as is and then tinker with it if you would like. Do you add the pudding mix as a powder or after you make it into pudding? Add as just the powder. I’ve made this cake at least 50 times. (Yes, that’s the true number) It is my favorite cake ever, and I have been making cakes for 60 years. I don’t have to look at the recipe, cause it’s in my head. Thank you so much Alice for leaving a review to let others know how much you enjoy this cake. I appreciate it so much! First of all I would love to say I absolutely adore your recipes. Intresting idea’s and delicious! I want to make this lemon cake but i’m having some trouble finding instant lemon pudding in my country. They do have instant vanilla pudding. Or do you have other idea’s? Hi Rozy, yes you can use the vanilla pudding in this recipe but it won’t be as lemony but it will still taste amazing! I’m going to try your recipe; I’ve been making a different version for years that a lovely lady gave me. Occasionally I fight against dense streaks that drive me crazy. Her recipe called for two sticks of margarine and one stick of butter. I think I’ve been alternating the ingredients wrong after reading your instructions and others. So I’ll be back in touch!! Yes let me know how it turns out for you. I will be making this cake for my sister for Christmas, going outside to pick some fresh lemons off my lemon tree. I always make the cream cheese pound cake but never put in instant pudding. By adding the pudding does it still taste homemade?? Do I need to add vanilla flavoring?? ?Looking forward in making it.I will freeze the cake so I can ship it to her. Looking forward in making it. It tastes amazing! You don’t need to add the vanilla. The entire cake is homemade so it still definitely taste homemade. I made the cake and it was so good! Yes some of my followers have tried loaf pans and had success. This cake was the bomb. I candied some lemons and used them as a garnish. Thanks for sharing this wonderful lemony recipe. Oh that is a wonderful idea! Hi Janie, did you add lemon zest? This cake came out beautifully. Something must have gone wrong. Followed directions but cake came out too dense! Like, I-must-have-a-cup-of-milk dense. I’m so sorry you had a problem with the recipe. It always gets glowing reviews so I’m not sure where you went wrong. Maybe with the flour? I just tried this cake! It is so moist! Love your recipes Jocelyn Thank you! Hooray that makes me so happy!! I just want to say, Thank you Jocelyn, for this recipe. I made this cake on Wednesday to share with family for the up coming holiday weekend. My house had an amazing smell. It was so easy to put together. I didn’t have any lemon pudding so I used what I had on hand, which was cheesecake pudding. I can’t wait to taste it this weekend. Thank you again. Oh lovely. Let me know how the cheesecake pudding worked for this recipe. Interested to know how the taste changed. I hope you enjoy it!!! Have a great weekend. Is the 3.4 ounces a weight or a dry measure? I am testing the recipe for our bake sale. Hi there, its the amount stated on the package when you purchase it. Make sure to buy the size that says 3.4 ounces. Thank you. Our market does not carry packages that are 3.4 or combined add up to 3,4. Will weigh the mix next time. This cake is absolutely divine! Everyone went wild for it, and one member of the family has already asked that it be her birthday cake. Quick question: Can you suggest a sifter that’s easy to use? Mine took ages and ages and ages, and so much effort. I bruised my hands on it! I’ve tried two different kinds, but both were arduous and painful to use. This is the best lemon pound cake ever! Very much in demand. My question, have you thought about covering in simple syrup? Hi Debra, I’m so glad you enjoy this cake!! I haven’t covered it in simple syrup since I find the texture and moistness to be my taste but I’m sure it will be really incredible with this addition. Let me know how it turns out for you. This cake is absolutely delicious! I can’t thank you enough for this recipe. It’s light, fluffy, and most importantly soooo lemony. This is an amazing Lemon Pound Cake, soooooooooo good, getting ready to make my second one 🙂 BTW I have your cookbook also, are you coming out with another one anytime soon? AMAZING!!! My family loves this recipe. This is my go to dessert recipe from now on. Hooray thank you so much! I’m so glad you love it. I made this for my beautiful girlfriend for Valentine’s Day and we enjoyed it. Wonderful! I’m so glad you enjoyed it. Can I use normal lemon pudding mix? It’s diffi to find instant lemon pudding mix in Australia! Just put the lemon pound cake in the oven. Definitely the best lemon pound cake I’ve ever tasted (I’ve baked it once before). My batter was so thick. Is it suppose to be like this? The batter is pretty thick overall so it isn’t thin at all. Hooray! I am so so glad you enjoy this recipe so much. Hi when using the mixer is better to the whisk attachment or the flat paddle attachment? I personally like to use the whisk attachment since more air gets in the batter but either one is fine. Can you use lemon zest that you get in the spice section at the market instead of cutting my fingers trying to zest a lemon or an orange? I would like to make your Lemon Cake. I look forward to your response. No that wouldn’t be the exactly same as the fresh zest. Dried zest is more potent so you wouldn’t put the same amount in. However you could add in some lemon zest to compensate. Company coming and I’m looking for some good dessert recipes that I can make in advance and freeze. Have you tried making this and freezing it? My thought was to glaze it after thawing it overnight. Love all things lemon and can’t wait to try this! Hi Lynne, I actually have never froze this dessert unfortunately so I can’t tell you for sure.